Here it is, guys! 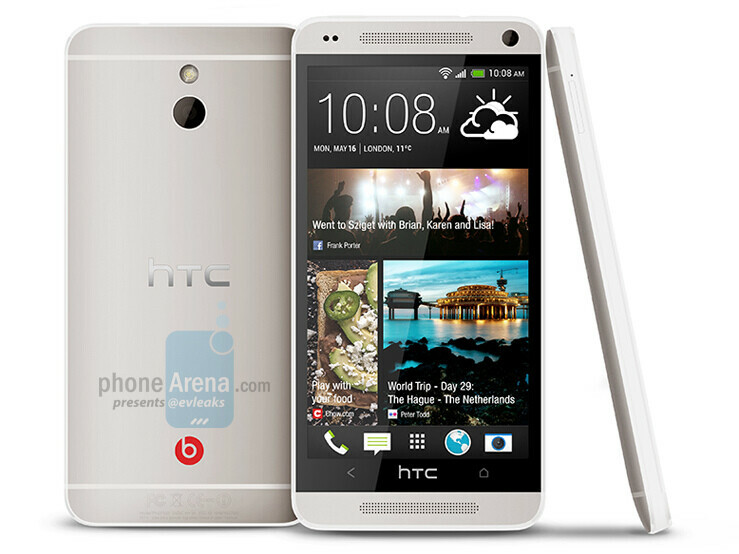 The rumored HTC One mini, also referred to as the HTC M4, has leaked in flesh and blood on the internet. Or at least that's what we think these photos are of – a more compact alternative to the HTC One smartphone, with a smaller screen and less impressive yet still decent hardware specs. 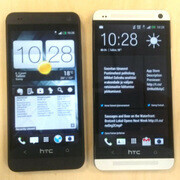 Speaking of hardware specs, the source of these alleged HTC One mini photos claims that the smartphone packs a 4.3-inch screen with resolution of 720 by 1280 pixels. There's also supposed to be a dual-core processor of some kind running inside the device, alongside 2GB of RAM and 16GB of storage space. The camera is of the Ultrapixel variety, offering 4MP of resolution, according to rumors. A close-up inspection of the device reveals a dual front-facing speaker arrangement à la HTC One. The newest Sense interface is also present, layered on top of Android 4.2.2 Jelly Bean. What the body of the smartphone is made of isn't clear given the photos' low quality, but we hope that HTC has stuck with the seamless metal construction found on its current flagship. The HTC One mini, or whatever the smartphone's real name turns out to be, has not been announced yet, but an official unveiling is said to be scheduled for July of 2013. Pricing at launch is allegedly set around the 400 euro mark, which is worth a bit over $520. they should be making 5+ inch version not even smaller. -_- 4.7 is small enough. Not everyone thinks that way. exactly 4.7 is perfect and 4.3 is more comfortable.. its far better than s4 mini. one mini can sells like hot cake. its suitable almost for every one that want a great phone in mid-range. What's wrong with doing small, medium, large? Cover all sizes and price points = win. oh dont you worry :) there are supposedly planned larger devices. However, this is brilliant for those who have smaller hands, like girls. Surprise of the day: 4.7" can be big or small, up to personal preference. Don't make your own preference the ideal preference. I'm one of those who feels 4.7" is perfect - big enough without overwhelming those with smaller hands. I'd take the vanilla One over the rumored T6. That's just me though. Not everyone wants 5+ inch dude, because some people think it's too big, especially those people with small hands. That's why HTC made a 4.7 inch One, compact and comfortable to hold, and 4.7 inch isn't small at all. not eveyone like giant phones that will look awkward! 4.7 is already the best size for a phone! if you want bigger than that for your videos, buy a tablet! It's not just about screen size but device size too.. you say 4.7 is best size and acting bigger you might as well get a tablet. The s4 is 5" but is slightly smaller than the one which shows that it isn't just about screen size but the actual device size that matters... It's no point having back small screen if the device itself is big, that's not really going to help n people with small hands.. which is why I have an isuue with the one mini because even though it's 4.3" which for a screen size is nice but imo the body isn't even that much smaller the the original one. My point being is what's the point of decreasing screen size if the device size isn't decreased that much.. The mini top and bottom bezel is bigger than the normal ones top and bottom bezels, you would think it would be smaller..I love the idea of smaller screens with top end specs but I want the device itself to be drastically smaller too and not just by a bit. Well said. I thought no one noticed. 7 inch tablets are cheap and powerful. I would rather a tablet in my backpack and a small phone for tethering, quick use or... calls/texts. 4.3 is pushing the envelope in as large as I want a phone. 5 inch is too small for a tablet and too big for a phone. is that a mega 6, to go with the active and zoom, and while we are at it toss in a note... I'm waiting to see the note 3 mini. A mini big note? Samsung Galaxy Biggie Smalls? Still better than Galaxy S4 mini. Wow. Just wow. 4.7" is considered mini these days? You know, I wanted a phone, but apparently those are out of style. I must hold a tablet to my ear. Now that's how you do midrange in 2013! Keep it up, HTC. hope they put a big battery in there at least 2100mah. but.. knowing htc.. they release phones and keep thinking it's pretty enough to distract people from battery issues.. aside from htc one of course. How does that look like the iPhone 5?? It's a black, rounded-off rectangle?